A former Senior National Champion, Commonwealth Games bronze medalist, Manchester 2002 and at one time ranked five in the world, Fiona has spent the last ten years coaching at the highest level. After four years as Director of Squash at New York’s prestigious ‘The Height Casino Club’, she served at national level as Performance Coach for England Squash. In this capacity, she attended the Commonwealth Games, Delhi 2010 and World Team Championships, New Zealand 2009. 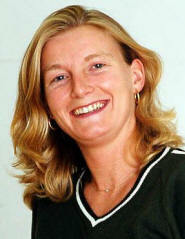 Fiona says “I am delighted to be coaching at East Glos, a club that I have been a member of for many many years. East Glos was a club I used weekly as a training venue when I was a full time player on the International Tour. “I retired from the International Tour after twenty amazing years as a professional travelling the world. For the past ten years I have fully immersed my life into coaching, firstly in Brooklyn, New York for four years as the Director of Squash at the prestigious club, ‘Brooklyn Heights’ and most recently for England Squash as a Performance Coach. “Coaching at England Squash took me to new heights as a coach, the experience and opportunities I received developed me into a world class coach. Coaching existing and promising world class players around the country and then leading them into world individual and team events has always been my dream since retiring from the game. 1st4Sport Level 3 award in Assessing Vocationally Related Achievement.